I guess people’s (in) ability to say “sorry” is not unique to the digital landscape. However, you do not have to be a rocket scientist to see that the web and social media have made mistakes and public relations disasters a lot more public and transparent. I am always particularly interested in one’s ability to hold his hands up and say “sorry”. A few weeks ago I came across a great example of saying “sorry” when I read this blog post by Giacomo ‘Peldi’ Guilizzoni. Peldi is the founder of Balsamiq, a 4-year old company that created Mockups, a wireframing tool that helps programmers and user experience (‘UX’) staff design software by letting them sketch ideas and then collaborate over them. 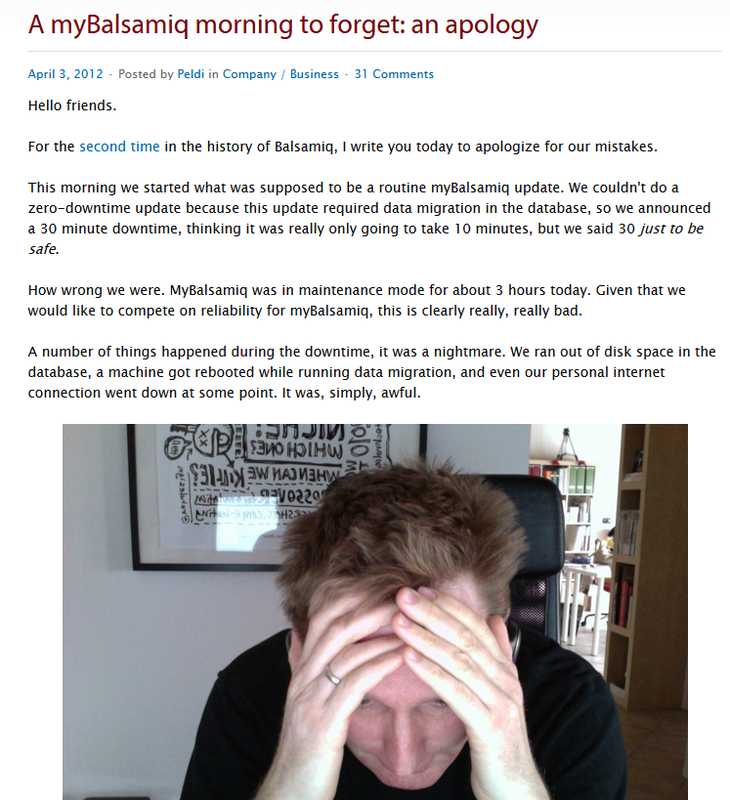 In his blog post, Peldi apologises for the 3 hours of downtime in which myBalsamiq users were unable to use their online UX project tool and explained exactly what had happened and where Balsamiq went wrong in what should have been a short, routine database update. I do not think that Peldi wrote this blog post just because he was happy to hold his hands up, be transparent and to reimburse his customers. He must have realised that for a product that aims to “want to compete on reliability”, a significant breakdown of the application is not a great look. He therefore must have felt compelled to make a clear statement. Total transparency – Other than personal user data, not much else is out of bounds under the “radical transparency” banner. This can vary from businesses publicly sharing arguments for and against a proposal to the guys at Balsamiq being completely open about cocking up. Open engagement (1) – Increasingly, companies have started using tools like Lithium and Get Satisfaction to directly engage with their customers. Businesses like 7digital (where I work), Spotify and TomTom are using designated platforms to engage with their customers and to address any queries users might have. Open engagement (2) – You could argue that some of the conversations on such customer platforms don’t go far enough if you were to fully adhere to the “radical transparency” mantra. Rather than replying to such a customer query by saying: “Unfortunately, we don’t support our software on such and such device device”, a business could go a few steps further by explaining that “We looked into supporting our software on this device but it proved too expensive to implement and we feared that it would give our customers a really bad user experience. Here are some of the draft wireframes that we used at the time to sketch and highlight some key development and user issues. Please tell us what you think and whether these issues would matter to you?” A business could then open up this discussion by for instance blogging about it and throwing it out to the developer community for input and suggestions. Empowering customers – Involving customers in a public decision making process is a critical aspect of public transparency, as I outlined above. Sites like GoodGuide, Sourcemap and SkinDeep aim to provide consumers with product and company data to help in making those decisions. For example, it sayson GoodGuide that fashion brand Ralph Lauren “does not make a meaningful commitment to using environmentally preferred fibers.” The financial sector is in my opinion an industry that could benefit from radical transparency, standardising financial information and being more open with its customers. Customer data vs customer input – It is interesting to see that whilst a data-driven focus seems to be getting a strong hold on software development (think Eric Ries and “lean startup”), there is also a growing focus on qualitative customer input through the “radical transparency” movement going on at the same time. Businesses like Balsamiq strongly believe in concentrating on what the customer wants and not just improving through continuous testing and measuring performance. Main learning point: I tend to have a great respect for people who can just hold their hands up and say “sorry”. Especially when that apology comes with an honest explanation of what happened and how you are looking to make up for it. The “radical transparency” movement urges businesses to be much more transparent and to actively involve customers in their decision making processes. Balsamiq seems like a great example in this respect, I like how they consistently try to be transparent and involve their customers. How smart is Smart TV?